The Complete Vegetarian Handbook is an appealing introduction to cooking without meat. It has over seventy recipes, which is still far fewer than many of the most popular vegetarian cookbooks, but it is full of useful information about different kinds of food and how to prepare them. The book is a 280-page paperback about the same dimensions as a regular hardback, which makes it easy to handle and browse. This will be attractive to the many readers who are daunted by the massive tomes that need to be placed open on a table in order to read them. At the start of the book is a long introduction to equipping one's kitchen, stocking one's pantry, and planning menus. This is followed by nine chapters on different kinds of foods: vegetables, fruits, pasta & grains, soy foods, legumes & sprouts, baked goods and more. There are glossaries for different kinds of cooking greens, salad greens, mushrooms, nuts, beans, rice, and others. The explanations are clear and helpful. What's more, the book is full of hints and guidelines about to prepare many different foods such as tofu, polenta, noodles, roasted peppers, and leeks, and this is bound to be useful to both novice and even more experienced cooks. The recipes in the book are distinctive and interesting: they include lentil and escarole soup, braised tofu in barbeque sauce, pineapple fried rice, Portobello burgers with pesto-pepper mayo, and roasted beets with orange dressing. Maybe not all will appeal to readers -- I'm rather skeptical about wasabi mashed potatoes -- but most are mouth-watering and relatively easy to prepare. 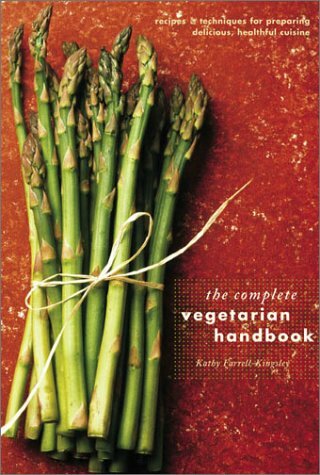 The Complete Vegetarian Handbook is an elegant, well-organized and user-friendly guide to healthy cooking.